Get Rid Of Beer Belly Fat! 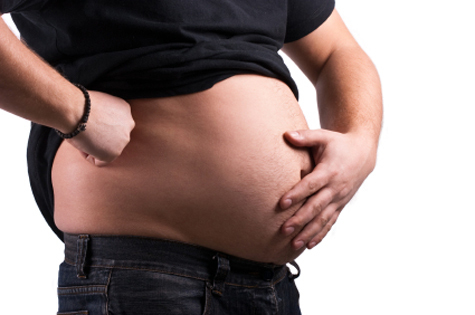 Beer belly fat on men is a huge health danger and a turn-off to women. A beer belly in college may have been "cute", but not in adult life. You can get rid of your beer belly with a proven program. Before we go any farther, let's deal with the facts: Male belly fat has been directly linked with dangerous health consequences that include Type II diabetes, heart disease, liver disease, kidney failure, insulin resistance, and erectile dysfunction. That's a bad list. One we want to stay away from. You came to this page because you are interested in getting rid of your beer belly and becoming more healthy. I promise to keep the information real for you. The good news is, you can lose beer belly fat with a proven program that focuses on good food choices, regular and consistent exercise, and intelligent cardio. It will take time and effort (mostly mental), but you can do it if you commit to being the healthiest male you can possibly be. * The best way to lose beer belly fat is to do it naturally. Stay away from expensive (and worthless) supplements and dangerous fat loss pills. * Patience and commitment will be your watchwords. DO NOT get sucked-in by websites offering "Fast Fat Loss" or "Lose 30 lbs in 20 Days." This will be the hardest part. * You will need to commit to making the best food choices possible. Thousands of other guys have been successful, so can you. * DO NOT get sucked-in to the nonsense that you can drink protein shakes to burn fat and build lean muscle. There are benefits of protein shakes but they are OUT of the equation for now. * You must commit to understanding what situations sabotage your fat loss efforts. Tailgating with the guys, or eating a bucket of wings at the pizza place while you watch the game will have to go. This will be extremely tough. * You must commit to drinking more water and getting more sleep. The benefits of drinking water cannot be understated. Learning all you can about what foods build lean muscle, what foods are most easily stored as fat, and how to control portions will require considerable commitment on your part...but you can do it. While diet is the #1 critical element needed to burn belly fat...strength training to build lean muscle, as well as intelligent cardio, complete the triangle. * Burn this into your brain: You CANNOT exercise-off, or run-off, all the calories needed to lose male belly fat. It is impossible. DO NOT get sucked-in on courses that promise you this. Optimal nutrition is ALWAYS at the head of the line. * Getting to the gym on a regular and consistent basis will take a huge amount of commitment to yourself, yet it will pay you back tremendously. * There are NO secret or magic fat burning workout plans to eliminate belly fat. You must engage in full-body workouts that focus on fundamental lifts. * There is absolutely NO truth to the nonsense that high reps (12-20) burn fat, while low reps (3-8) build bulk. All that talk is horse pucky. Your focus will be on strength building, and that will entail different reps schemes as you improve in building lean muscle mass. * Your cardio will start out with slow, continuous activity until you build up the needed strength and endurance to change the tempo. However, it should never be mindless. * Once you gain the necessary strength and stamina, your cardio will evolve to include interval training. This is what Olympic and professional athletes utilize to burn fat and maintain lean muscle. 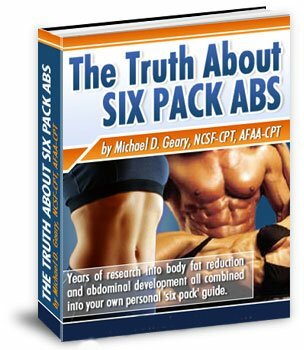 The Truth About Six Pack Abs is the best-selling program by Mike Geary that has helped 1000's of men change their lives. * Although the title appears to center only on specific ab exercises, it actually only contains 20. The main focus is exactly where you want it: Making good food choices, and strength building with weight training. * You will learn about the importance of calorie sources and the foods that will benefit you the most. * There are eight levels of strength training workouts and eight levels of abdominal workouts. * The strength training workouts are full-body and involve fundamental multi-joint lifts that are best for gains in lean muscle mass. * Mike's program focuses on progressive improvement. Results may come slow (and hard) at times, but he gives you the tools to maintain progress. The Truth About Six Pack Abs is a proven program that will help you get rid of beer belly fat. Start now on a path to better health and building a body that women will find appealing.